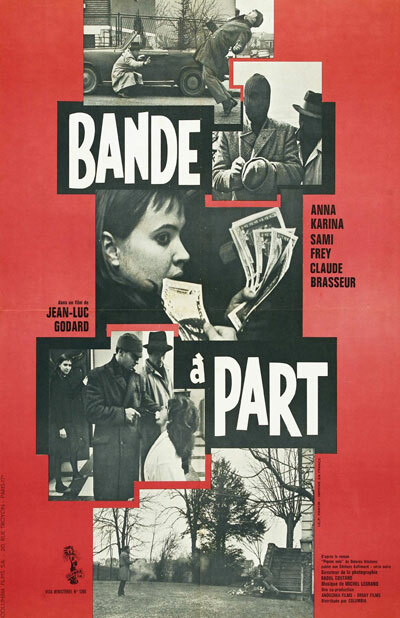 French Fridays updates with the Main Title of another classic of French cinema, Godard's Band À Part - a low budget crime flick that was strongly influenced by American B-movies in the heist genre. The fast sequence of jump-cuts used in the first part of the opening titles produce an almost stroboscopic effect, which is must have been quite disorienting to viewers who watched the movie on the big screen. French Fridays curator Laure Magalie takes a closer look at this 'petite piece' of French motion art. 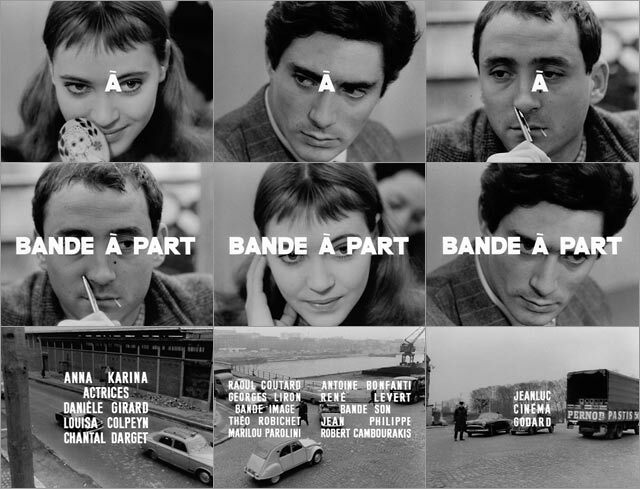 The story of Jean-Luc Godard's Band À Part takes place over three days. A pretty young woman named Odile meets with her two friends, Arthur and Franz, at an English course. Odile reveals to the two boys that her aunt keeps a large sum of money hidden at her house, and it's not safely guarded. The trio decides to steal the loot. Deeply rooted in New Wave cinema, Godard's titles once more to reflect the style that he uses throughout the film, alternating between long, continuous shots and staccato jump-cuts. The director wanted to break with the cinematic conventions of the time and invent a new language. To achieve this, he is innovating through editing techniques and the use of a very specific soundtrack. 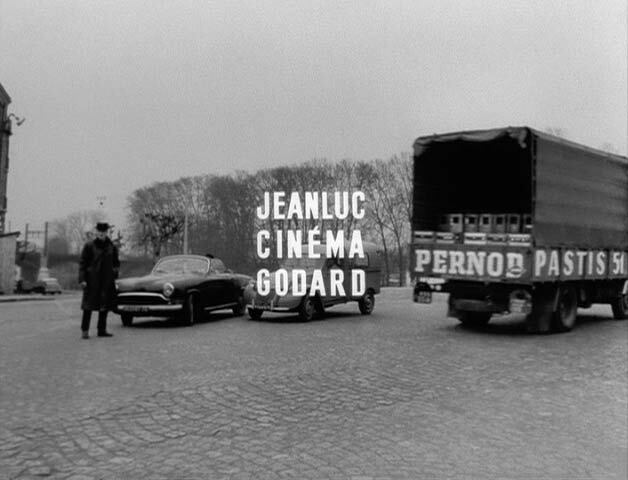 Band À Part (still) Not a coincidence: Godard's directing credit superimposed on a Citroën 2CV, arguably France's most iconic car, and a truck carrying Pernod Pastis -the famous French aniseed liquor, another symbol of modern France- passes by. Band À Part (still). A comment in the titles that is rather mysterious to me: "For the last time (?) 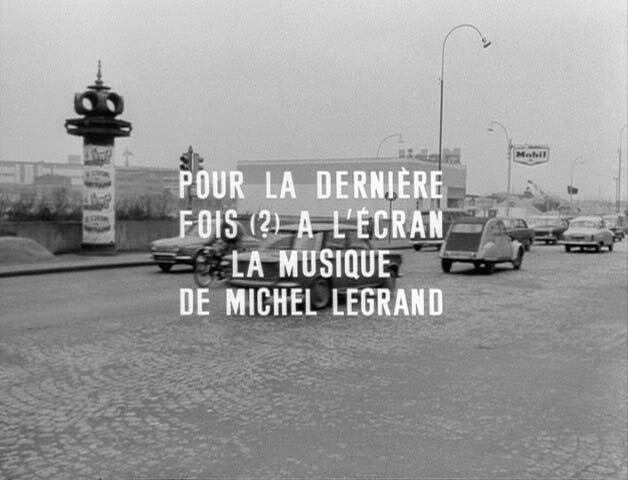 on the screen the music of Michel Legrand." If someone knows the answer, please leave a comment below! The opening titles start off with a continuous sequence of staccato jump-cuts to an almost stroboscopic effect. The letters of the Main Title are superimposed onto the eyes of the three protagonists, making it more difficult to 'read' their faces. Everything moves so fast that we are confused, just as our heroes: the faces of the two boys, who are trying their best to project a dark and brooding 'tough guy' appearance are intercut with shots of a candid Odile, simpering, not knowing where to look, as if she's pondering which guy to choose. Only three shots, in sync with the joyful jazzy music, linger a little longer and help the spectator better understand what has been goping on until now. The music stops abruptly, as we're thrown into wide shots of the noisy traffic jams following each other slowly, showing that the action is set at Joinville, in the Parisian suburbs. Haunting music gradually gains momentum. Godard uses sounds not so much to accompany a scene, but to accentuate it and to build up the tension. When I interviewed Jacqueline Fouchet about the the work of her husband, title designer Jean Fouchet (see also: Topkapi), she told me this funny anecdote. One day, Godard went to see Fouchet and asked him, "I want you to tell me how I can edit a sequence with very short shots," and Fouchet replied, "Just cut it!" Godard, who didn't expect such a straightforward answer, said: "You're absolutely right!" and left. He then made the titles for Band À Part a little while later. This title sequence perfectly confirms a statement Godard made in one of his articles for the seminal French film magazine Cahiers du Cinema in 1956: "Si mettre en scène est un regard, monter est un battement de cœur.” (If directing is (about) a vision, editing is (about) a heart beat). Quentin Tarantino was such a fan of Band of Outsiders, that he payed tribute to the film by naming his production company A Band Apart. And the famously cool dance scene between Uma Thurman and John Travolta in Pulp Fiction is a nod to the equally memorable dance scene in Bande à Part featuring the three stars dancing 'The Madison'. * Cinéma Z is a French term. It is considered the lowest form of filmmaking. Bordering on amateur filmmaking, Z films have very low production values, lower than B movies. Text: Laure Chapalain, © Submarine Channel 5 October 2012. Thanks to Willemien Ruys for finetuning the translation. Last update: October 9, 2012.